Poor first half defending saw Mansfield Town succumb to a fourth consecutive away loss as they slid back into relegation trouble at the bottom end of League Two with defeat at Morecambe. The Stags had given themselves some much-needed breathing space with a morale-boosting home victory over Stevenage at the weekend. But as other struggling teams picked up points, the concession of two goals inside the first 25 minutes from strikers Paul Mullin and Kevin Ellison ultimately cost them dearly. Simon Heslop’s first goal for the club since netting at Portsmouth in October gave Adam Murray’s side some hope – especially as it came with two-thirds of the game still to play. Yet while Mansfield did firm things up at the back in the second half, they were unable to force a leveller, allowing the Shrimps to arrest their own recent dip in form by running out victors. The defeat, Mansfield’s 10th on the road in League Two this season, leaves them just two points clear of the relegation zone, with only Cheltenham, York and Hartlepool below them. The Stags made two changes at the Globe Arena to the side which recorded a first victory in seven league games with the 1-0 win over Stevenage. Having gone through the pain barrier to continue with a gashed leg against Graham Westley’s men, Chris Clements missed out and was replaced in the centre of midfield by Heslop. The other change saw Saturday match-winner Reggie Lambe come in for Billy Kee – the switch manager Murray had made at half-time against Stevenage. Youngsters Jack Thomas and Joe Fitzpatrick were named on the bench. Inside the first minute, Lenny Pidgeley was forced to turn a shot on the turn from Mullin around his left-hand post after Ellison had flicked on Shaun Beeley’s thrown-in from the right flank. Mullin had a clear sight of goal soon after – when Ellison took advantage of getting away with a push to put him into space – only to shoot straight at Pidgeley, who grabbed the ball at the second attempt. As Mansfield threatened for the first time, Heslop’s up-and-under caused confusion in the Shrimps defence, but Lee Beevers had both a first drive from the edge of the box and an instantaneous follow-up well blocked. The Stags almost went in front after a slick move that split Morecambe wide open. Vadaine Oliver laid off Ryan Tafazolli’s ball forward to Simon Heslop on the halfway line and he released Beevers scampering down the right. His low, first-time cross was met by Lambe on the edge of the six-yard box, whose low finish was superbly blocked by the diving Andreas Arstidou. Back came the hosts in what was a lively start to the game with an effort from Mullin into the side-netting when he stretched but could not wrap his foot fully around the ball. In the 14th minute, Ellison almost latched onto a long ball forward only for Pidgeley to get their first after racing off his line. Beeley’s far post cross then found its way through to Laurence Wilson whose first-time snapshot was always rising over the top. Alan Goodall, who played for Mansfield during the Paul Cox era one pre-season prior to a move to Fleetwood, was left holding his head in his hands moments later when his long range drive bound for the left-hand corner was brilliantly turned aside by Pidgeley. However, from the resulting flag-kick, Morecambe went ahead with a 17th minute opener as Mansfield switched off. A short corner from the right pulled back to Beeley allowed the wing-back to whip in a dangerous low ball that left Mullin with the simple task of re-directing the ball home from close range. Mansfield tried to bounce back quickly but Oliver’s volley was blocked after Michael Raynes had nodded a Lee Beevers left-wing corner back into the danger zone. Oliver was in the thick of the action again when he rose highest for another corner, this time from the right, but could only find the arms of Arestidou. The Shrimps took a firm hold on the game by doubling their lead in the 25th minute – and it was another goal Mansfield would have been hugely disappointed to concede. Mullin won the flick-on to a long punt forward far easily to release Ellison and, as he cut inside, Tafazolli slipped, allowing the striker to run on and plant his finish just inside the right-hand post from just inside the box. Realistically, the Stags needed a quick response – and got it in the shape of a fantastic strike from Simon Heslop. Lambe was brought down just outside the box and Heslop stepped up to curl an inch-perfect 27th minute strike just inside the left-hand post, giving Arestidou no chance. That good work, though, was almost undone straight away as first Goodall flashed wide of the left-hand post when well placed and then Ellison’s powerful header from another Beeley centre was turned aside by the busy Pidgeley. 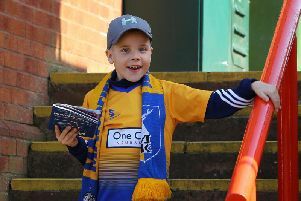 There was finally a hiatus in the non-stop action as the break approached when Matt Rhead required treatment as he went down under a heavy challenge that some of the Mansfield players felt was two-footed, but was not deemed even to be a free-kick. Morecambe bossed the closing stages of the first half without proving as incisive as they has earlier in the match, but Murray would have simply been relieved the half-time damage was not even worse. Suitably stung, the Stags boss made two changes for the second period, with Rhead and Beevers making way for Junior Brown and the 17-year-old Fitzpatrick, who was making his senior debut. It saw Mansfield revert back to what appeared to be a 4-5-1 formation, with the teenager sitting just in front of the back four. In the early stages, at least, it seemed to work as Tafazolli’s miscued shot following a Raynes header was blocked and Jamie McGuire’s rising drive was pushed over Arestidou. Mansfield’s players and fans were aggrieved just after the hour as Simon Heslop was booked when they felt he was the one on the end of a late Morecambe challenge. The Stags almost fashioned an opening when Callum Elder – who has extended his loan from Leicester City by a month – crossed to the far post for Oliver, whose header into the six-yard box dropped just out of the reach of a Mansfield team-mate. The visitors were forced into their final change in the 71st minute when Raynes limped off and was replaced by Martin Riley. And as they continued to search for an equaliser, Lambe blazed high and not so handsome while Oliver flashed across the face of goal from the tightest of angles. A better opening presented itself with just five minutes left as Sutton’s miscued shot straight into the path of Brown whose effort from 10 yards lacked the power to beat Arestidou when he might well have scored. A minimum of six minutes were added at the end of the game and, during that, Heslop cut in from the right flank to blast too high. That was as close as Mansfield came as Brown wasted a good opportunity to put in a dangerous ball from a short corner in the dying seconds. Morecambe (3-1-4-2): Arestidou; Hughes, Edwards, Parrish; Devitt (Amond 77), Beeley, Goodall, Fleming (Kenyon 66), Wilson; Ellison, Mullin (Redshaw 66). Subs not used: Jones, Sampson, McGowan, Doyle. Mansfield (3-4-1-2): Pidgley; Sutton, Tafazolli, Raynes (Riley 71); Beevers (Brown 46), McGuire, Heslop, Elder; Lambe; Oliver, Rhead (Fitzpatrick 46). Subs not used: Studer, Riley, Bingham, Thomas, Kee. Mansfield’s man of the match: Simon Heslop.